Here I will continue with DePatie-Freleng’s obscure theatrical shorts. By 1972, DFE had stopped producing The Ant and the Aardvark, Tijuana Toads, and Roland and Rattfink shorts. In addition, they have put the Pink Panther on temporary hiatus. However, they were still contractually obligated to continue providing theatrical shorts for United Artists’ release. All of this meant that it was time to create a new series. And thus we have the Blue Racer. The Blue Racer is a blue snake and, as the name implies, he can slither incredibly fast. He actually first appeared in a Tijuana Toads short called Snake in the Gracias (1971), directed by Hawley Pratt. Here, the snake goes around trying to capture Toro and Pancho for a meal. However, he is constantly thwarted by amnesia-riddled Crazylegs Crane (who would later get his own series years later) guarding them. After the Toads ended, the snake was spun-off into his own series. 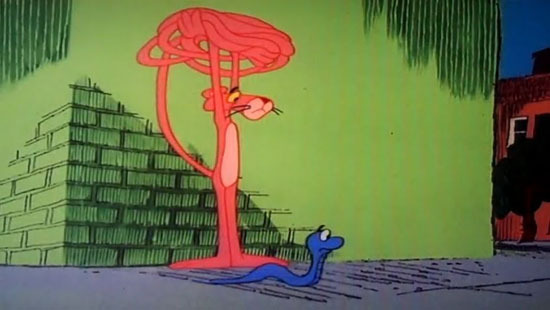 In the earlier shorts, Blue Racer is seen preying on the Japanese Beetle, who also appeared in Tijuana Toads several years earlier in Hop and Chop (1970 – directed by Grant Simmons). Even by 1972, the racist, stereotypical caricature of the Beetle was already outdated and problematic, but they were likely able to get away with it because the cartoons were released theatrically, and thus fewer people saw them. Even then, there must have been some pressure, because the character was dropped half-way through the series. Later Blue Racer shorts had the snake encountering a wizard looking for sneak sweat (Blue Aces Wild), two mischievous leprechauns (Killarney Blarney), or a W.C. Fields bear (Freeze a Jolly Good Fellow). Crazylegs Crane even appeared in several shorts (Blue Aces Wild, Aches and Snakes, and Snake Preview). Bob Holt voiced both Blue Racer and Japanese Beetle in the pilot cartoon Support Your Local Serpent (1972), but for the rest of the series Larry D. Mann voiced Blue Racer, with Tom Holland doing Japanese Beetle. Other voice actors were brought in for one-shot characters, including Paul Winchell in several shorts, as well as a surprise guest star Mako in one cartoon, decades before Samurai Jack and Avatar: The Last Airbender. The Blue Racer was released from 1972 to 1974. Gerry Chiniquy and Art Davis took turns directing most of the shorts, with Robert McKimson, Sid Marcus, and Cullen Blaine Houghtaling (still working in animation today) filling in for one short each. In addition, two shorts were subcontracted overseas: Aches and Snakes (1973) at Film Graphics in Australia, and Little Boa Peep (1974) at Pegbar Productions in Spain. For those films, fake names were used for animation credits. DFE storyman John W. Dunn wrote all 17 shorts. 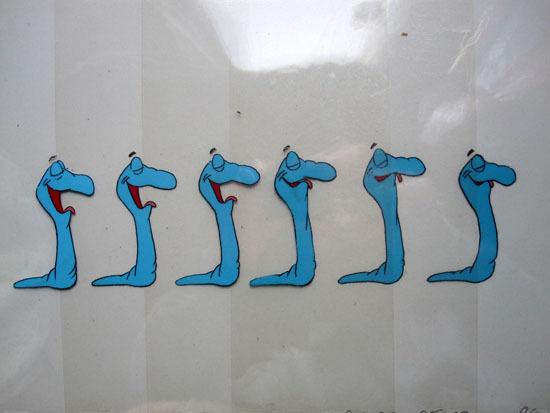 The Blue Racer made his final appearance in the Pink Panther cartoon “PinkTails for Two” (1978 – Directed by Art Davis), where he mistakes the Panther’s tail for a female snake. You know, my parents were big movie fans, so we went a lot back then, but for all the time we spent at the theater, I don’t remember ever seeing a DePatie-Freleng cartoon anywhere but on television. Where did you grow up? I think the cartoons were distributed a lot in the South and mid-West. 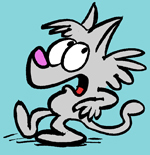 I grew up in northern and southern California and never saw a DFE theatrical cartoon. The first cartoon I ever saw in the theater (besides Disney features) was a reissue of “Knighty Knight Bugs” with the first release of “Superman The Movie” in 1978. In the New York City area, the Century Theatre chain played EVERY live action and animated short released by United Artists. Where I grew up in Queens you can depend on a Pink Panther (or later DFP short) at the Fresh Meadows or the Prospect in Flushing every week in the 1960s and 70s. Now I wonder if any theater in my town even carried the DFE shorts at all, especially since the downtown theaters were already closing down and the only things left were the drive-ins and mall cinemas elsewhere in town. Be pretty tough to ask someone who may recall locally 40 years ago. The Pink Panther Show arrived to Argentine television in 1974. 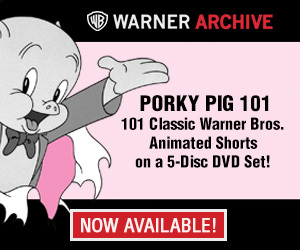 Shortly after it premiered, United Artists released a compilation of DFE cartoon shorts during the winter vacations. It was the only time I saw them in a movie theater (exactly the same cartoons that aired on television, but in color and in English) although the shorts were only from the Pink Panther, The Inspector and Ant and the Aardvark series. Well at least you got to see them in their intended fashion! For someone who’s last name is quite a workout to say, it’s nice to see he’s still at it, though IMDB credits his latest project as being from four years ago (timing director on G.I. Joe Renegades). Charles, these DePatie-Freleng posts are great! Keep ’em coming! I’m really enjoying learning more about this studio. Aside from Jerry’s Pink Panther book, any other reading material you could recommend would be appreciated. I’ve used what I surmise is your handiwork on this website (http://dfe.goldenagecartoons.com) to piece together my knowledge of DFE Enterprises (and piece together a good-sized collection of shorts and specials) — but I’m always eager for more in-depth information. 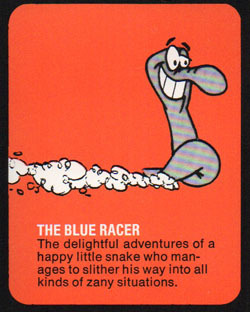 There was a Blue Racer cartoon I saw in the theater around ’77 or ’78 featuring the Calypso Bee from Trinidad. Blue Racer’s girlfriend was being courted by a studly snake, Ralph, until he laughed at her new hair-do (a snake with a hair-do?) Anybody remember that one? You will do things my way! I’m from Southern California, born and raised. In the 1970s and 80s I saw some DePatie-Freleng United Artists-Misrch Geoffrey shorts, including before the Airplane sequel (one of 80s first major franchises) the swansong for the Ant and Aardvark, redoing a lot of Freleng bits, “From Nurse to Worse”,1971, with John Byner as the Ant and Aarvark and radio character actress/DFE cartoon voice Athena Lorde as the nurse.I saw a lot of theatricals growing up in Southern Calif. in the 60s. The first Blue Racer short I’ve ever seen. The old Warner formula was wearing pretty thin. That the Japanese Beetle is truly embarrassing doesn’t help. Like ’em or not, you gotta admit getting comic action out of a snake (no arms or legs, etc.) must have been a challenge for the DFE crew. I saw at least one Blue Racer in a theatre here in northern Wisconsin back in the 70’s, darned if I remember which one. For a while, this theatre booked cartoons with most of their features; either DFE or Walter Lantz reissues, but they gave it up eventually because the cartoon cost them a whole ten bucks a week! I’m guessing Hoot Kloot is next. Y’know… as bad as the DePatie-Freleng product seems when viewed in large clusters, individually… when viewed among other “stuff” (like, say, theatrical feature films)… they are quite good. The animation is still superior to Saturday Morning’s lineup, if inferior to Disney… if we still consider Disney’s ROBIN HOOD as something to measure them by. Obviously a moviegoer was not going to see strictly Blue Racer cartoons in a theater and quickly find them repetitive like we toon buffs here, but seeing CAMERA BUG before an action-packed feature such as THE MAGNIFICENT SEVEN RIDE would have garnished the usual “in the moment” laughs. Another thing to remember is the key audience coming to see the main feature the cartoon supported. Some of these may have attracted an over-40 crowd quite comfortable with “Japanese” beetles… since they may have also watched the latest WW2 epic showing “our boys” battling The Japs. Although it took a LOT longer for Asian stereotyping to die out in both movies and TV than the black and native American kind, the Chinese always fared better than the Japanese since they were never The Enemy at war time. Basically this character is just a rehash of Speedy Gonzales and it is simply the appearance and voice that is disturbing. Instead of no mouse shoes and a big sombrero, we have slanted eyes and “chop suey” talk. Otherwise, it is interesting to note that, like Speedy, the beetle is The Winner here, while the all-American snake is the dumb-dumb Loser. No doubt, the animators thought they were doing the right thing here. … wanted to add something. That CAMERA BUG reminded me of another DPE, but I only just remembered which one… SMILE PRETTY PRETTY, SAY PINK.